"This neighborhood, actually. I love street style, I'm a fashion stylist and I get a lot of my inspiration just from living in this neighborhood." 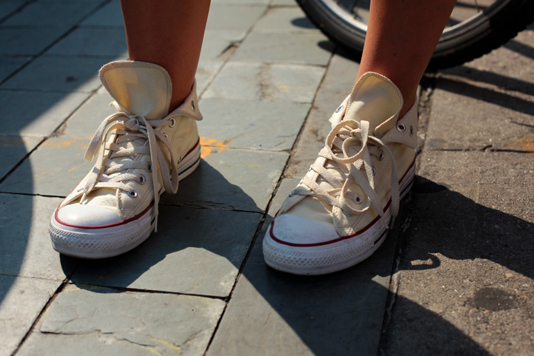 Converse® high tops, folded down with tongue up. Wow, she's super cute. And that's coming from a gay. I can only imagine what the straight boys and gay girls think. Yowza. Great shots! This girl is beautiful! I love the Converse shoe treatment. @H A - I was. Back in SF now, have a few more pics to post. @Todd X. - Totally. I actually ran after her because she's got amazing presence. @MS Hospitality - me too. I think folding your shoes down might be a "thing" now.